We are delighted to announce a new book cover design for Fairweather Publishing. 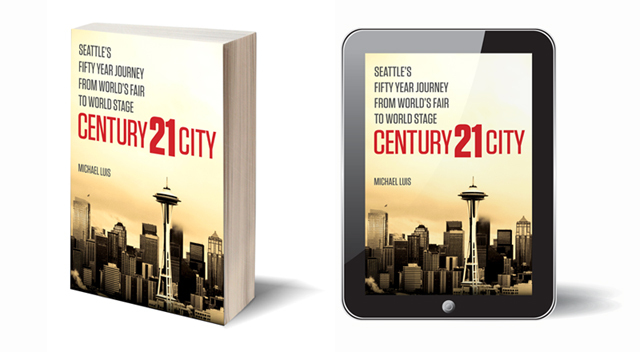 Century 21 City, by Michael Luis is a unique take on the fifty year journey of Seattle from rain-soaked backwater to economic, technological and cultural powerhouse. We have been fortunate enough to collaborate with Mr. Luis on a variety of projects that span a small part of Puget Sound history, including his work with the Greater Seattle Chamber of Commerce, The Housing Partnership, The Economic Development Council and a history of Hunt’s Point, WA, so a hearty congratulations to him on the new book. Oh, is the book available on Amazon (just one of the economic game-changers outlined in the book) and Barnes & Noble you ask? Hell yes.